“Alright. Can you tell us where is Durgadi village”? “Yes, just before the ascent of Varandha, take a left turn and you will go towards Janani Devi Mandir at Durgadi”. Apparently this villager was oblivious to the existence of Mohangad recently discovered by Mr. Sachin Joshi, archaeological researcher and writer. A hectic week in office and delay in finalizing the actual trek location didn't allow me to prepare a detail plan for this trek. As Chinmay and Tushar also had not much done any reading on the fort and relied on me, I asked them to find information on the Internet while I was driving. Lack of data network on the route left us no option but to enquire about Mohangad to the villagers along the way. After getting information from the villager, we started our drive further. Route to Varandha ghat is one of the worst and nightmare to drive. Had Charles Dickens travelled on this road, he would have definitely termed it as "triumphant perfection of inconvenience". Sparse traffic on the road along with beautiful scenery around made it slightly bearable. Glistening water of Nira Devghar Dam provided feast to the eyes. There is a board indicating the direction to “Janani Devi Mandir” located in Durgadi village, base village of Mohangad. It was a scenic drive till Durgadi. We hardly came across any vehicle till our drive towards base of the fort . We parked our vehicle after giving up on the dirt road full of rocks and uneven surface.It was around 10 am and already October heat had started to take its toll. After wearing caps and sunglasses and stuffing adequate water in rucksacks, we started our hike. Scarecrows looked so real from the distance that we mistook them as real men. Farmers in this area seemed really smart and along with real looking scarecrows, they also had made an arrangement of generating noise by hanging few sticks and oil barrels on top of the trees. So whenever there was wind, oil barrels swayed hitting the sticks and generating the noise to keep birds and animals at bay from the crops. We still were not sure about the trail. Fortunately, a shepherd came to our rescue and with his instructions, we got an idea of the trail and marched ahead. We climbed around half of the hill and took a traverse and reached to a small plateau. From here, we witnessed a full view of magnificent Mohangad. We followed the trail and just after reaching the col, we turned to left trail entering the woods.Canopy of branches overhead was providing a shelter from the scorching sun. We traversed the whole breadth of the fort and elated to come across a small temple. Now, we were on the western side and a large expanse in Konkan was visible. Mangalgad was also clearly visible on the South-West side. 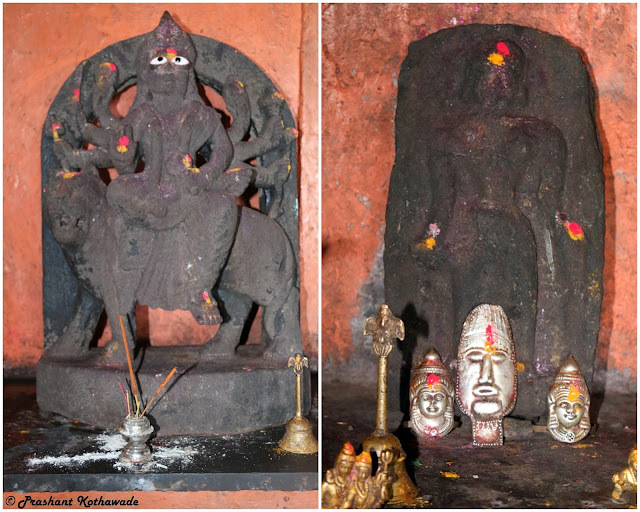 There are few beautiful and ancient idols in the temple. There was a pot filled up with water inside the temple which we used to get freshened up. We had some snacks followed by rest and started with fort exploration. Presence of thick bushes and tall grass made it impossible to go on the Southern side and we came back to temple within ten minutes and decided to descend. As we were not carrying any map, we were not sure regarding the location of the water cisterns. Fortunately, we spotted a distinct trail right at the start of our descent. To our ecstasy, this trail led us to first water cistern which was dry. As Chinmay and Tushar were studying the type of water cistern, I ventured ahead and excited to find another water cistern, this time full of water. After exploration, we decided to descend, Descent was quick and we reached to our car soon.During our whole trek, we didn't come across a single soul except the shepherd who showed us initial trail. Soon, we were on our way to Varandha Ghat. On the way, we crossed a bridge built over the river and as it was lunch time, I proposed the idea of having lunch near the river. Splashing water on the faces and submerging feet into knee deep water evaporated all the lassitude and tiredness and instantly, we felt rejuvenated. After lunch, we resumed our drive towards towards Kavlya fort situated in Varandha Ghat. It was hot and humid when we reached to the Monkey Point in Varandha Ghat. After gulping two glasses of lemon water at monkey point, we replenished water levels in our bodies, While gulping the lemon juice, we chatted with the stall owner and asked him about the way to Kavlya fort. On getting his instructions, we proceeded further.We parked our car just at the start of our trail towards Kavlya fort. As the place was swarming with monkeys, we made sure to close car windows properly and tuck water bottles inside our rucksacks. Traverse leading to the fort was very slippery with valley on the left side. Whatever shoes you wear on such surfaces, you never know when you slip. So we had to utterly cautious on each and every step. Trail gradually led us to top of plateau. Trunk of the mountain was protruding like a snake on the backdrop of layers of mountains. Rawness of mighty Sahyadri was unleashing in front of us and we just could not take our eyes off from this breathtaking sight. On the other side, Kavlya fort was beckoning us. We soon entered the woods. Trail was distinct through the wood as well. After coming out of the woods, trail with tall grass on both the sides led us to base of another hill. There was a water body at the base of the hill. One trail was leading to top of the hill and other was traversing across the hill. We were not sure which trail to follow and decided to check the traverse first. Trail led us to base of the hill on the other side and there were thick blankets of bushes prohibiting us to see anything other than bushes. We spotted a trail going on top of the hill but considering thick bushes where it would be easier to get lost,we traversed our way back and went to the original location from where we had taken the traverse.We now took the other distinct trail going on top of the hill. This trail again entered canopy of high bushes. For few moments on the trail, we had to find our way through thick bushes. This trail did not seem to be frequented but we kept on walking and soon came out of the woods. To our elation, we finally reached to our desired location, on the edge of North-West part of the fort. 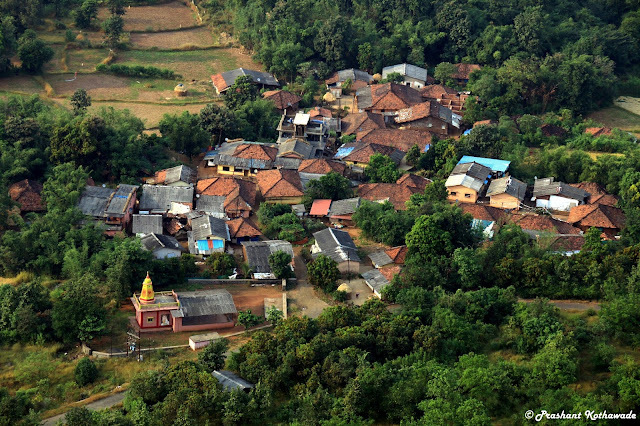 Looking down, a small village in Konkan was visible and I really had to zoom the camera to click this picture. We lingered at this point resting and soaking in the great sights of two mighty forts - Torna and Rajgad. There was a distinct haze in the atmosphere prohibiting us to take clear pictures of these forts. Nevertheless, we were thrilled to get sightings of these forts. Around 4.30 PM, we decided to return. This time, we spotted another trail descending to the northern side and decided to take it as it was distinct and the earlier trail that we had taken was slightly cumbersome. To our elation, we descended within five minutes from the bushes and came to base of the hill from where we had returned earlier and decided against entering the thick bushes. Finally, we reached to start of the trail but not before slipping once or twice on the slippery traverse. Just before reaching to our car, we spent some time in watching the acrobatics of monkeys ascending the pinnacle in front of us. It was around 5 PM and we decided to proceed to our next destination, Mangalgad. After hectic day of the trek, there was temptation of spending next day relaxing on the beach considering nearest sea shore was not too far from our current location. But after much discussion, we unanimously curbed the temptation and easy way and decided to stick with option of hiking on Mangalgad next day. We took the left turn towards Pimpalwadi after descending Varandha ghat. Along the way, we dropped a villager at Vadghar village. He seemed to be an interesting fellow who incessantly talked about local politics and made many jokes on the politicians. He invited us at his home for stay and dinner. As Mangalgad base was still more than 10 kilometres ahead, we politely refused his request and went further. Sun was about to set and we stopped at a location to click few photos of sunset. On arriving at our destination, we parked the vehicle in front of statue of Chatrapati Shivaji Maharaj. A guy coming from the motorcycle stopped on seeing us and enquired about us. He was the brother of local MLA and showed us the home where we could get dinner. Piles of freshly cut rice crop was stacked nicely in front of the house. Part of the house was converted into the shop and we asked the shop owner whether he could arrange dinner for us. After giving a thought, he nodded in affirmative. We were given a bucket and we filled it with water from the hand pump right in front of the house. After getting freshened, we perched and chatted with elderly uncle and his son for a while. We soon started having hunger pangs but there was still some time for dinner. To kill time, we decided to take a stroll around the village. On our return, hot dinner was served to us and after getting satiated, we thanked the family for dinner, paid for dinner and proceeded towards the the temple for our stay at night . Temple was absolutely well maintained. It was clean and well illuminated with electricity. To our ecstasy, its fan was also in working condition. While Chinmay and Tushar kept chatting to avoid sleeping immediately after dinner, I tucked myself into the sleeping back and immediately drifted off to sleep. We were roused from sleep by the noise of caretaker entering the temple early in the morning. It was 6 in the morning and it had already dawned outside. I called Chinmay and Tushar breaking their sound sleep and after finishing early morning chores, we started our hike around 7.10 AM. As I and Chinmay had already hiked on Mangalgad before, we proceeded without any guide. 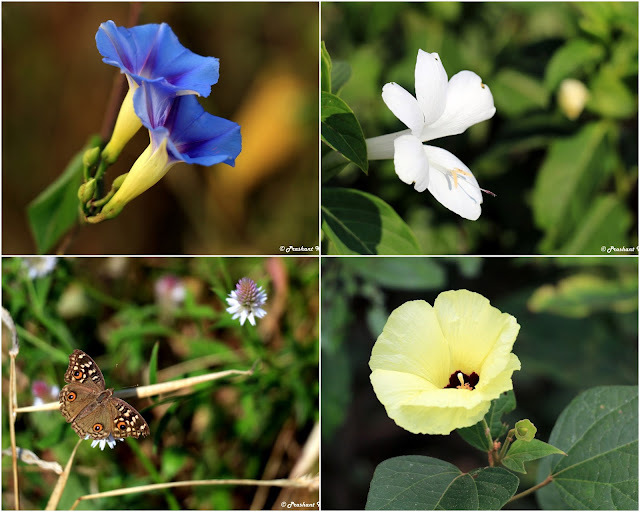 Last time, when we had visited Mangalgad in monsoon, we had taken a long, winding route but this time, we decided to take a short-cut going through the woods. We had had fair idea where this route would take us. Also, there were arrow markings which made our job easier. Soon, we came out of the woods and joined the main trail. We saved considerable distance as well as time by taking this short-cut. 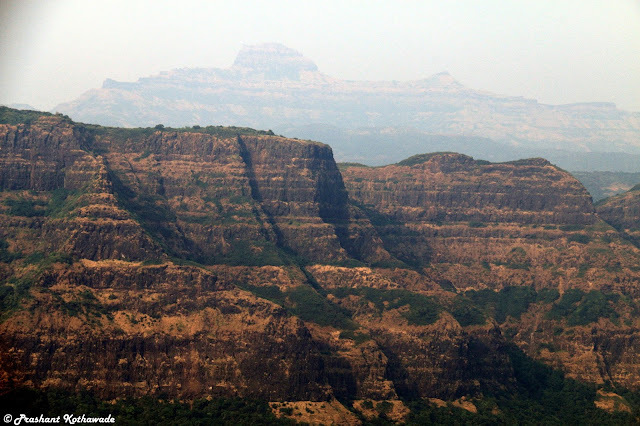 Mangalgad basking in the warmth of morning sun welcomed us as we landed on the first plateau. We decided to take a snacks break but there was not any place to sit. Grass was reigning the whole plateau. Finally, we decided to munch on the snacks while standing. After breakfast, we marched ahead. We had to make way through the tall grass as most of the trail was hidden under the tall grass.Finally, we were on top of the fort. 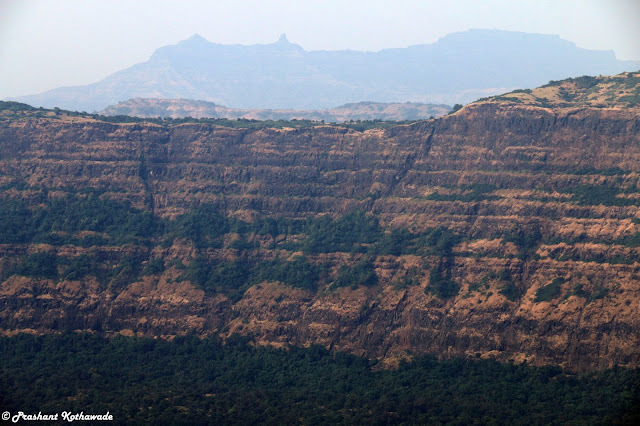 During monsoon, whole Mangalgad was submerged into the clouds restricting visibility. So this time, we were elated to have a clear sightings of the whole surrounding region. Layers of mountains surrounding Mangalgad provided some breathtaking sights. After getting refreshed with the cold water in the water cistern on the fort, we started descending. We were very quick and reached base around 10.10 AM. We took total of 3 hours to finish our hike. After getting refreshed at the base, we started our journey back. After experiencing the bad condition of Varandha Ghat, we decided to go via Tamhini Ghat. As we hadn't breakfasted enough, we took the early lunch break at Mahad. After heavy lunch, we proceeded towards Pune via Tamhini Ghat. Before 4 PM, we reached to Pune bringing an end to two exciting days of adventure. I am leaving you with beautiful collage of flowers and butterfly spotted during the trek.